Buying your first semi-automatic espresso machine is not as hard as it may sound, but the truth is that you do need to know what you’re looking for in one and the factors to consider prior to making the purchase. Luckily, we’ve already done the hard work for you and came up with some tips that are going to help you decide on the best one for your needs, regardless if you’re a business or an individual who wants to enjoy delicious espresso shots brewed in the comfort of his own home. Check to see how the switches are positioned and see whether they are easy to understand and read intuitively. Check the cup warming tray and ascertain whether it’s just a fancy aesthetic or you can actually use it. Check the cleaner between the drip tray and the spouts and see whether it’s wide enough to fit the cups you’d like to brew into. Lastly, check the portafilter handle, how far over it needs to go so it can be locked, the way it sits in the machine, whether you are required to hold a clasp in place in order to prevent the filter basket from falling out and so forth. 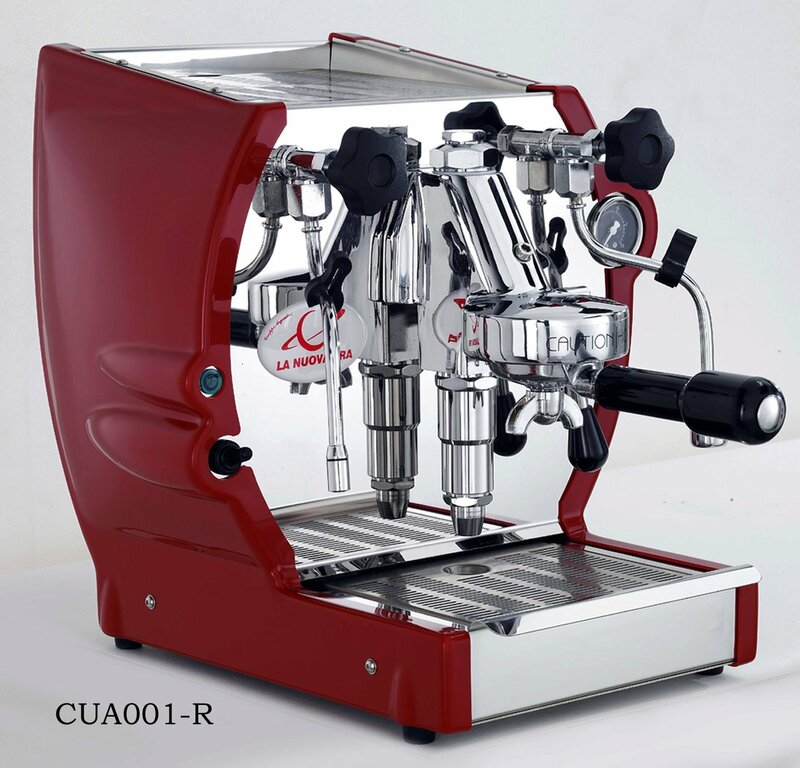 It’s very important that the materials used for the construction of the semi automatic espresso machine are high quality and here we’re talking not only about the exterior, but also the internal parts and the boiler. In the majority of cases, metal is always a lot better than plastic. Great grippy rubber feet, simple to access bolts for disassembling the machine, but also metal drip trays are all things that a high quality espresso machine should incorporate. Now depending on your preferences, some people will prefer electrical buttons, while others can swear that mechanical switches are a lot better. For instance, some people are going to find that it’s very gratifying to feel the lifting of the small lever on an espresso machine that’s fitted with an E61 grouphead, while others are simply cannot imagine using an espresso machine that doesn’t have the satisfying clack that you hear when using the brew switch on the Rancilio Silvia. And while it’s true that mechanical switches can also break, replacing one can be a lot easier than shopping for a complete circuit board. With that being said, let’s take a closer look at some of the most popular semi automatic espresso machines you can currently get and see which of them may soon become your personal favorite. If you want to get the Best Semi-Automatic Espresso Machine, then undoubtedly the Breville BES870XL is certainly one of the best that you should seriously consider. Since only high quality materials are used in its design, you can have the peace of mind that this model is going to last you for years to come. When the burr is activated, the no slip feet ensure that the machine stays firmly on your counter-top, preventing accidental falls. In terms of design, the BES870XL is housed in a very stylish casing made of stainless steel, making it a timeless and attractive addition to any kitchen. The unit is also very easy to clean and on top of that easily removable drip tray, it also features a hideaway storage compartment. Integrated half pound bean hopper and conical burr grinder: By maximizing the grinds’ surface area, the conical burs greatly improve the extraction of flavor from the bean. For a fuller espresso flavor, it’s very important to use freshly ground beans every single time. When it comes to the hopper, it features a locking system for easy transfer of coffee beans, storage and removal. 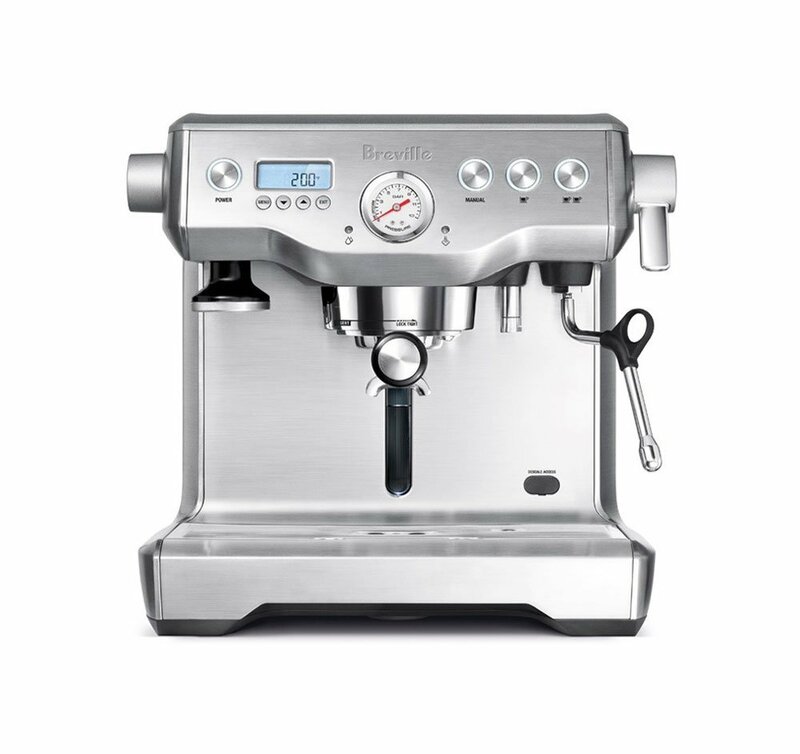 Other features you’re going to love about it include a filter size button, grind amount and grind size selector dials, 54 mm tamper, hands free grinding cradle, but also volumetric control and a 67 fl oz water tank (removable). Intended for small restaurant, office and home use, the Pasquini Livia 90 incorporates sturdy commercial grade components, but also excellent features and functionality that set a new standard for what it’s possible from a home espresso machine. This is actually one of the Best Semi-Automatic Espresso Machines out there and it’s highly recommend for the espresso aficionado. 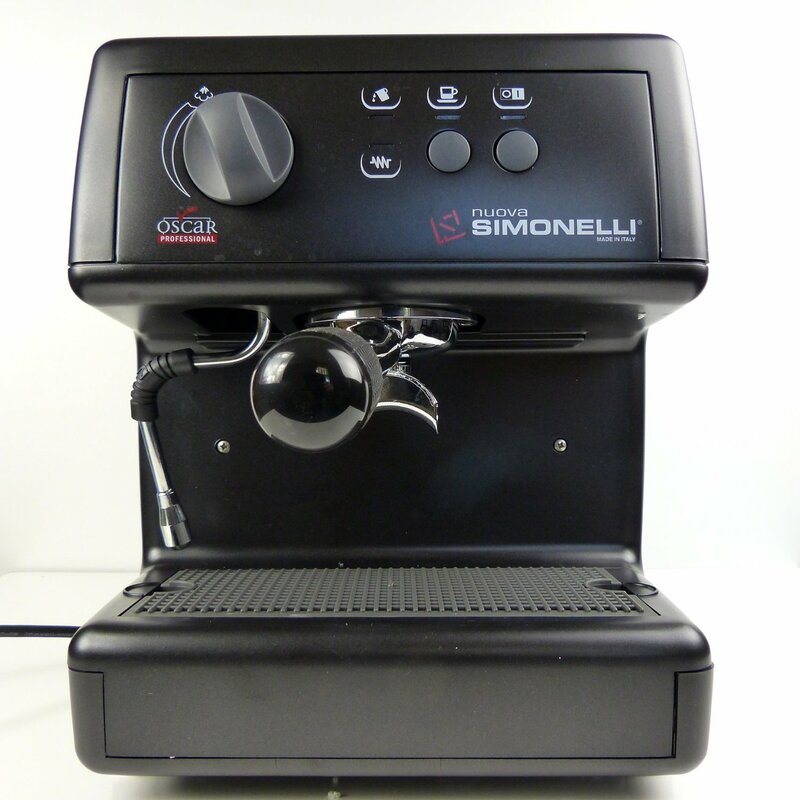 One thing you’ll love about this model is the fact that its boiler is used for steaming on demand and when it comes to the espresso water, it draws directly from the built in reservoir. With this espresso machine, you can finally steam instantly and produce espresso shots one after another. In fact, frothing milk and brewing espresso is never going to be a problem for the Livia 90. Not only is this vital for those that want to use it in a c commercial environment, but it also saves you the need for waiting on the boiler to recover between the milk heating and espresso brewing functions, which is the case with each single boiler machine. While the Livia 90 is a semi-automatic espresso machine, it doesn’t come with the one-touch brewing system that’s available in the automatic version. 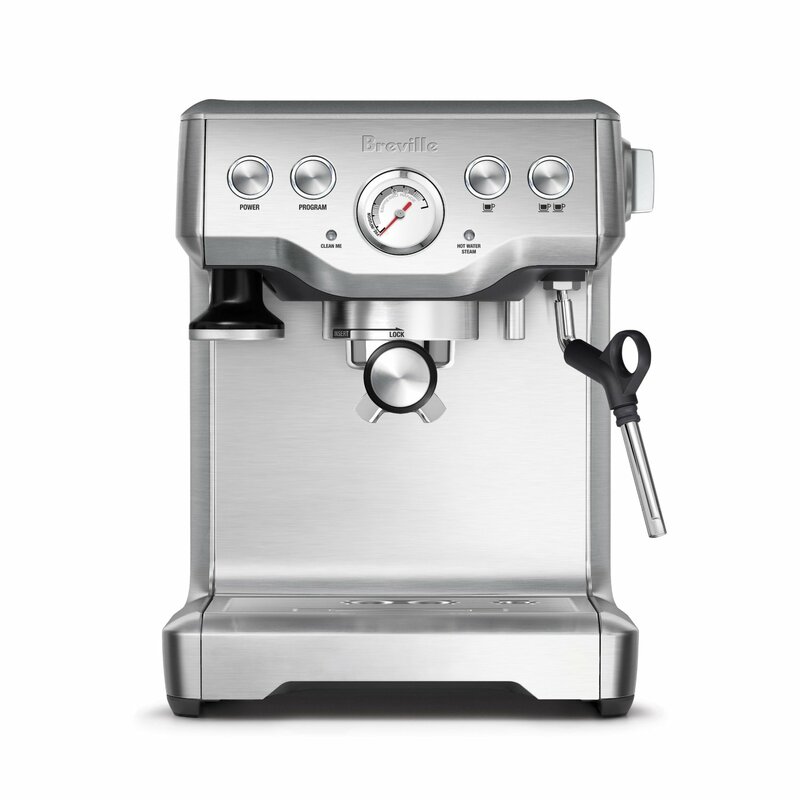 This Breville BES840XL/A the Infuser Espresso Machine is feature rich in the semi-automatic espresso machine category. It has some features normally found in super-automatic machines. For example, it has programmable volumetric control and automatic temperature settings. Another energy saving feature: it goes into sleep mode after 1 hour, and it shuts itself off if not used for three hours. However, let’s focus on the functions a bit. For one, at the start of the extraction process, the pre-infusion function will apply low water pressure in order to ensure the grinds are gently expanded in order to make for an even extraction. Secondly, if you’d like to be able to accurately control water temperature, you can now do that thanks to the 1600W thermocoil heating system that features an integrated water coil (stainless steel). In terms of accessories, the BES840XL features a water filter with holder, cleaning tool, cleaning disc and tablets, stainless steel jug, coffee scoop, but also dual and single wall filter baskets. Other highlights include a cup warmer, but also a special feature which helps removing the extra water from the filter basket after the coffee extraction process is over. The amazing, yet compact Bezzera BZ07 is an excellent espresso machine made of stainless steel and is a wonderful addition to any kitchen. 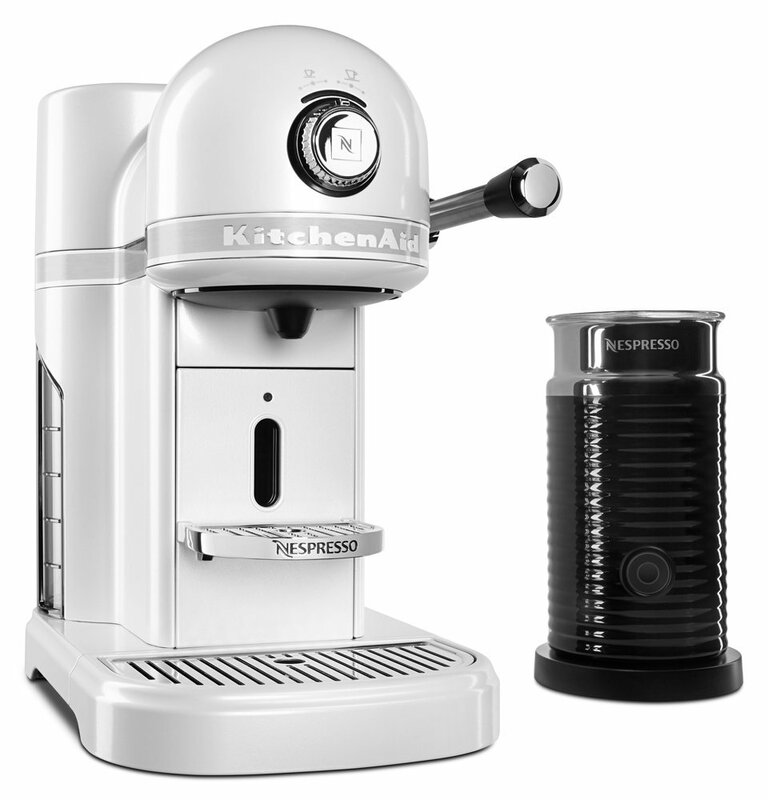 This model is capable of preparing some of the most delicious espresso shots you’ve ever had and since it also comes with a host of features, you can have the peace of mind that it’s going to satisfy the needs of even the pickiest espresso lovers out there. Since the BZ07 is classified as a semi automatic machine, this means that you need to press a button in order to start the extraction process and then press the same button again in order to stop the process. The grouphead of the BZ07 houses a thermostat (that accurately monitors temperature) and 2 electric heating elements, while the boiler temperature pressure is monitored by a PID sensor in the boiler and a PID micro CPU. In terms of features, the BZ07 also comes with a spring loaded, lever type steam and hot water valves, OPV adjustable for changing the exiting overpressure created by the pump, strong copper boiler, thermostat controlled heated fifty eight millimeter grouphead and a multi directional hot water and steam wand among other features. 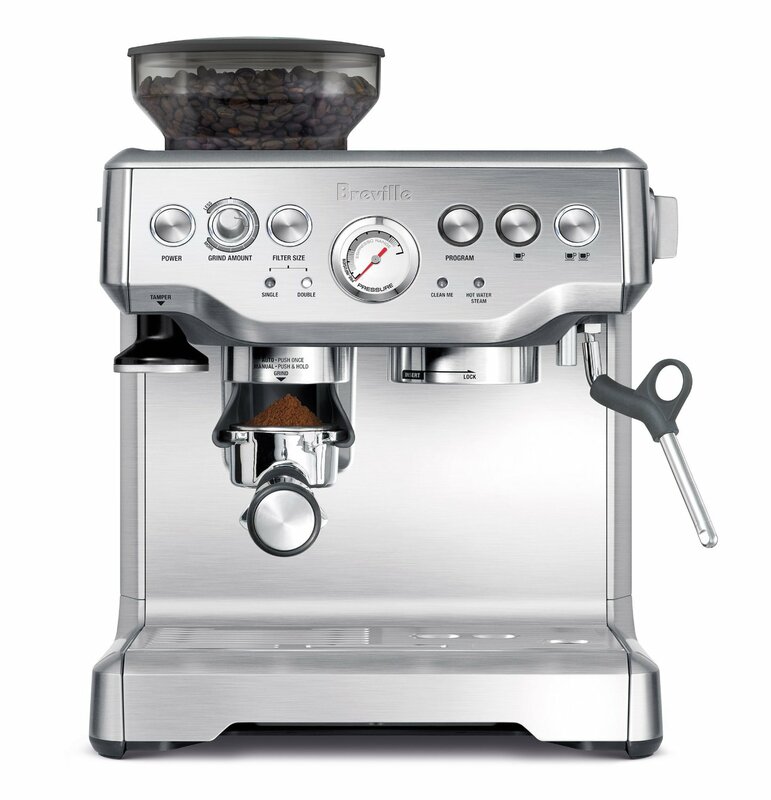 The Breville BES920XL is one of the most impressive semi-automatic espresso machines available. It produces superior espresso drinks with exceptional crema. It is a well-built model with many features commonly found in more expensive machines. For example, it has dual boilers which allows low pressure infusion with programmable duration and pressure. If you’re an espresso machine connoisseur, then you’re probably aware of the fact that this feature is only seen in top of the line commercial espresso machines. The BES920XL comes with a stainless steel heat exchanger. It delivers pre-heated water to the boiler through the steam boiler, helping thermal stability for ideal extraction temperature. Controlled by the PID technology, the actively heated group head is able to ensure that thermal stability is maintained throughout the entire extraction process. Lastly, thanks to the low pressure pre infusion process, the Breville BES920XL dual-boiler espresso machine is able to increase water pressure gradually at the beginning of the extraction in order to expand grinds gently and ensure an even extraction. Also, the backlit LCD display adds a great touch to the overall look of the machine and it can be set to display time, shot clock or brew temperature. Manufactured in Italy, the La Cuadra espresso machine is ready for both home and commercial use thanks to its excellent list of specifications that include a copper boiler, group and coffee handle. In fact, if you’re the type who is very picky about his espresso shots, then you may certainly want to give this model a shot. For one, it comes with a one point eight liter boil, a three liter pour in reservoir, but also 1 hot water tap, 1 steam wand and 1 group, giving you plenty of functions to help you make the perfect espresso shot. The unit can also be used both as a catering unit or at home and since it’s easily portable, you can also take it along with you on special occasions. In total, the La Cuadra has a capacity of sixty drinks per day, which means that no matter how many friends you have over, you can rest assured that it’s going to be able to prepare espresso shots for everyone. Design wise, the unit features red side panels with stainless steel accents which make the unit really stand out. If you’re one of those people who never thought that you’d live to see the day when an affordable heat exchange espresso machine would hit the market, it seems that the Oscar from Nuova Simonelli is here to finally prove you that this is indeed possible. This unit is not only cheaper by a few hundred dollars compared to similar models out there, but it also employs a high quality construction that’s going to help you get many years of use out of it. One thing you’ll actually love about this is that it is available in 2 water sources, including a tank model and a plumbed model. If you have a small cafe setting or want to brew a lot of coffee at home, then the direct connect model will suit your needs best. Overall, the Oscar is very easy to use and not only does it feature a stylish look, but it’s also going to help you prepare some of the most delicious espresso shots you’ve ever had. In terms of features, the Oscar comes with a removable tray, sturdy construction, a cup warmer, great steam pressure, large water tank, direct connect, professional portafilter, simple interface, heat exchanger. The Nespresso D60 is undoubtedly one of the most budget friendly semi automatic espresso machines you’re going to find on the market today. Not only does it feature dotted side panels with chrome accents that give it a special look, but in terms of performance this is one of the fastest machines of its type. In fact, it features a powerful pump and advanced thermoblock heating system that’s able to press with up to nineteen bars of pressure. 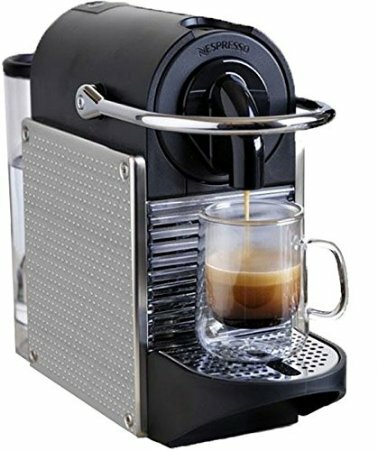 If you love espresso shots with lots of rich cream, then it’s recommended to use this machine with the Grand Cru coffee capsules from Nespresso. The total heat time for the Nespresso D60 is just twenty five seconds, which is pretty quick, with other features including an illuminated LED refill light and a 24 oz removable water tank. Better yet, you also have a folding drip tray for larger cups, programmable buttons for lungo and espresso, auto power off, water level detection and backlight indicators. In total, the unit can hold ten used capsules. Combining technology with the premium and iconic metal design, KitchenAid has managed to come up with a very impressive semi automatic espresso machine that’s certainly going to be the first and last unit for a lot of people. The KES0504FP comes with a milk frothier as well, meaning that all your espresso shots are going to taste exactly the way you want them to. If you love the nespresso coffee quality, then the KES0504FP’s nineteen bar pressure system is certainly going to deliver in this regard. In terms of features, you get a one point three liter removable water tank, solid die cast, all metal construction, a brew strength selector and an easy loading capsule system. Besides these, the KES0504FP also comes with a set of sixteen Nespresso capsules. 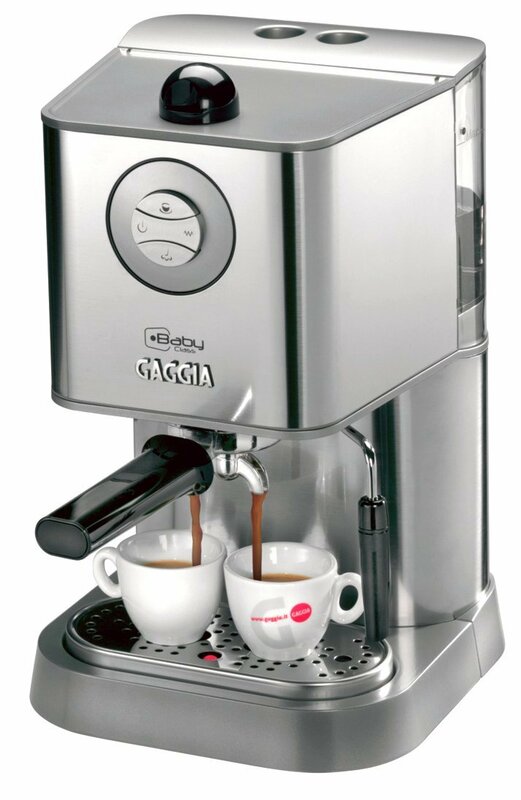 Known for its sleek brewing controls and excellent stainless steel build quality, the Gaggia 12300 is one of those few semi automatic espresso machines on the market that are going to simply stop you in your tracks and convince you through their unique set of features and impressive design that you definitely need to own one. 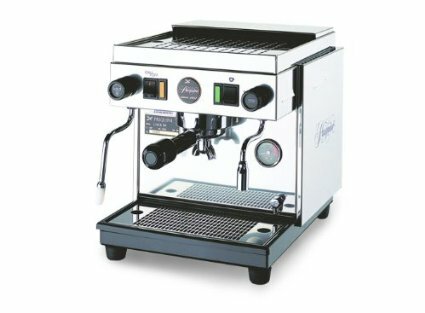 This specific model incorporates high quality components that are manufactured in Italy, including a 3-way solenoid valve, a heavy fifty eight millimeter commercial style portafilter and a chrome plated brass brew group. If you’ve steamed and frothed before, then you probably know that this is in most cases, very hard to get right, but the good news is that the Gaggia 12300 finally managed to help take the guesswork out of this. As a result, you can now steam and froth like a real pro and prepare delicious espresso shots for friends and family. Notable features include a coffee scoop, coffee tamper, ESE filter basket, double shot and single shot basket, high wattage boiler, fifteen-bar pump and a sixty oz reservoir (removable) which can help you brew 2 cups at the same time. All in all, when you put everything together, you realize that the Gaggia 12300 offers the perfect balance between performance and style. When it comes to getting the best, there’s no doubt that the La Nuova Era Cuadra is by far one of the most impressive semi automatic espresso machines on the market today. First of all, the machine is not made in the US, but actually in Italy, meaning that you get excellent performance for both commercial and home use. Speaking of which, the La Cuadra incorporates a nice set of features, including a copper boiler, group and coffee handle. In fact, if you’re the type who is very picky about his espresso shots, then you may certainly want to give this model a shot. 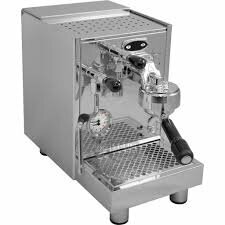 Due to the fact that this model can also be used in commercial settings, it’s the perfect choice for those who would like to start a small coffee shop and serve some of the best espresso shots you can get from an espresso machine in this class. One thing you’ll probably love about the unit, besides its excellent performance, is the fact that it has a pretty impressive design that incorporates red side panels with stainless steel accents. Overall, if you want the best and you have the cash to spare for it, then the La Cuadra is going to introduce you to a whole new world in terms of how tasty, aromatic and flavory your espresso shots can be. If you’re looking for an espresso machine that won’t poke your wallet, but still able to brew delicious coffee, then you should certainly consider the new D60 from Nespresso. One of the things that you’ll definitely love about it is the fact that it’s able to prepare espresso shots very fast, making it the perfect choice for anyone who needs their daily cup of coffee fast. Better yet, you can also prepare espresso shots with a lot of cream, but for that, you need to use the Grand Cru coffee capsules from Nespresso. When you think of the price and the fact that the D60 is not only fast, but also features a powerful pump and advanced thermoblock heating system that’s able to press with up to nineteen bars of pressure, you start to realize that what you’re getting for the money is simply amazing. But that’s not all. In fact, there are a few other features that are going to make you fall in love with the D60, including the illuminated LED refill light, the a 24 oz removable water tank, its 25 second heat time, the auto power off function, the water level detection and backlight indicators, the programmable buttons for lungo and espresso and finally, the folding drip tray for larger cups. From now on, preparing delicious espresso shots is never going to be a problem, since the D60 is the percent choice for espresso lovers on a small budget. Highly recommended!